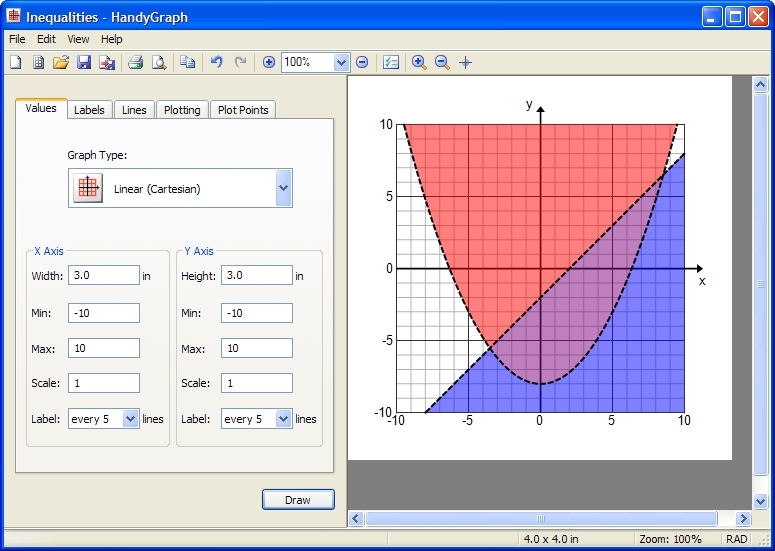 This graphing software produces Cartesian graphs and number lines, as in the examples. Plot Points by simply clicking on your graph. Create Blank Graphs just how you want them. Graph Inequalities on your coordinate grid or number line. Graph Functions of x or y. Export your image to use virtually anywhere, print the graph, or view the graph interactively like a graphing calculator. Web authoring software, . . .
or any program that accepts images. Semester licenses, volume discounts, and site licenses are also available. HandyGraph 2.1 is a free upgrade for licensed users of HandyGraph 2.0. Buy it now, try it yourself, or see more sample graphs.